Honeybee toxicity test was conducted to evaluate the toxic effects of residues on foliage after planting hole application of systemic insecticide with a high toxicity to honeybee (Apis mellifera). The three systemic pesticides (dinotefuran GR, imidacloprid GR and clothianidin GR) were applied in the planting hole at transplanting of pepper and cucumber. The residue analysis of pesticides and the honeybee mortalities on foliage were investigated with time course. Although some differences in kinds of tested crops and pesticides, the honeybee mortality and the residual change on foliage showed the much similarity. The maximum mortality of honeybee by pesticide residues on the foliage was shown 7 to 14 days after treatment. But the effect of pesticide lasted for 21 days and then decreased. It was confirmed that systemic insecticides applied to soil can be affect honeybee mortality on foliage by absorption and translocation through the roots without any direct exposure. The risk assessment of pesticide influence on bees is based on the evaluation techniques developed and used by the US and the EU. The toxicity test for risk assessment includes the US EPA acute contact toxicity test (USEPA, 1996a), foliage residual toxicity test (USEPA, 1996b), OECD guideline for bee contact toxicity test (OECD, 1998b), and OECD guideline for bee ingestion toxicity test (OECD, 1998a). These tests are presented as the international standards for the risk assessment of pesticides with respect to bees. The risk assessment of pesticide influence on bees in Korea is being carried out in earnest with the Standards of Pesticide Registration, Standards and Methods for Ecotoxicity Testing (RDA, 2012). To secure the safety against bees, all the pesticides being registered are to accompany their toxicity reports with respect to bees upon the submissions. Currently, the risk assessment for bees are focused on the acute toxicity by direct contact and ingestion, and on the direct influence of pesticide on bees after the application of pesticides. Such method involves the evaluation of pesticide influence which can be observed in a short period of time after a direct exposure of pesticide to bees. In other words, since this method is only effective when bees are directly exposed to bees or when residual pesticide in plants is directly exposed to bees, it is difficult to investigate the influence of pesticides, which are in the form of granules or which translocate into plants. According to the recent studies, wherein translocating granules were used for the soil treatment of alfalfa field according to the test standards and Korean methods to evaluate the residual foliage toxicity to bees, it was found that the influence on bees cannot be decently evaluated when using the domestic standards, which adopts the test plant (alfalfa) (Kim et al., 2012). In Europe and the US, a long-term influence on bees is being studied as they ingest the pollen and nectar of plants which absorbed pesticides with low concentrations. Also, the importance of such studies is recognized scientifically. In fact, residual pesticides have been detected not only in the stems and leaves but also in the pollen and nectar via absorption, and the long-term influence has been observed on bees which ingested the pollen and nectar containing small amounts of pesticides (Halm et al., 2006; Benjamin, 2008). In order to assess the influence of bees on these translocating pesticides, the European and Mediterranean Plant Protection Organization (EPPO) has proposed a guideline for the registration of translocating insecticides (Tasei et al., 2003). As a method proposed by the European Food Safety Authority (EFSA) to assess the influence of bees on the translocating pesticides, the guideline suggests a differentiated means for the evaluation, which is diverted from the method for evaluating airsprayed pesticides. Particularly, the guideline suggests that more specific test methods are required to analyze the pesticide components within pollen and nectar in more complex conditions (Bruneau et al., 2009; EFSA, 2013). In addition, according to the report of Defra (Departed for environmental food and rural affairs), a more sophisticated evaluation method throughout a long period of time is required via tunnel test as well as field test on the translocating pesticide applied to the soil or seeds. The report suggests new method and guideline to improve the existing evaluation terms (Defra, 2009). This study was conducted to identify the drawbacks of the conventional bee toxicity test, which is suited to the air-sprayed liquid pesticides at diluted concentrations, and to suggest an accurate and realistic method for evaluating the toxicity of translocating pesticides on bees. The translocating pesticides used in this study are dinotefuran, imidacloprid and clothianidin. These pesticides are known to have strong acute contact toxicity to bees and to affect bees when directly upon the leaves of plants. Although since these agents are sprayed as the granules for soil treatment, the chance of direct exposure to bees is low. However, the translocating pesticides are highly water-soluble and are absorbed through leaves and roots. Their translocations upward can thus occupy the entire body of plants as the range of influence. It is difficult to exactly comprehend the influence of absorbed pesticides on bees when active bees come in contact with or ingest the nectar, due to such complex characteristics of the translocating pesticides. Bees are used not only as the pollinating insects for fruits but also for the crops which are cultivated inside greenhouses. While the use of pesticide as a soil treatment agent without the direct application to agricultural crops poses a low influence on bees, the application of translocating pesticides can indirectly influence active bees, according the period of translocation within the plant body and the residual period. Therefore, comprehending the toxicity of these pesticides, which are indirectly exposed to bees, is important to promote the safe use of the pesticides and to expect the safety of bees. Hence, in this study, basic materials for determining the safety of bees were to be prepared, by comprehending the influence of pesticides exposed to bees through leaves, which are absorbed through the penetration and translocation of pesticides used for soil treatment. 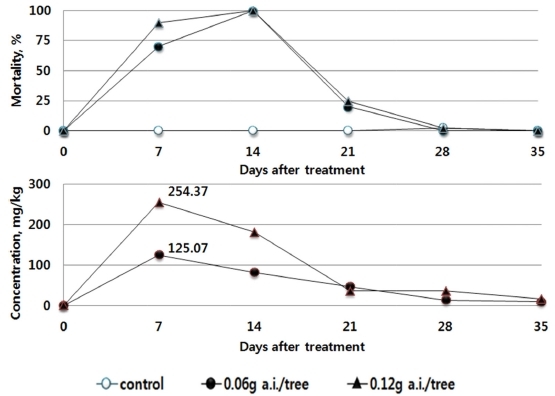 Also, by comprehending the relationship between the residual pesticide absorbed in the leaves and the trend of bee toxicity according to the existing method of foliage residual toxicity, the relationship between the two was to be experimentally investigated. The pesticides used in the foliage residual toxicity test on bees are highly penetrative. Commercial products of imidacloprid (2%), clothianidin (1.8%) and dinotefuran (2%) in granules were used for testing. Pepper (Capsicum annuum) and cucumber (Cucumis sativus) were used as the test crops. Seedlings grown for 4-7 weeks in greenhouses were planted in an outdoor field without covering. Upon planting of the crops, pesticides were applied for soil disinsection. A dropper hose was used for irrigation 1-2 times per week. A conventional culturing was applied. Solanaceous pepper and cucurbitaceous cucumber are well known for their cultivation in greenhouses. These crops largely depend on bumblebees or honeybees for pollination, and the safety of pesticide is very important, since pesticide usage can directly influence these pollinating bees. In this study, pepper and cucumber were selected, because they differed in their shapes of leaves. The specific aim of this study was to investigate the difference in the residual pesticide according to the different leaf shape, and its influence on bees. Soil disinsection was applied immediately upon the planting of test crops, as the treatment of pesticides. Two treatment dosages were applied before planting. The dosages were in accordance with the user manual. A recommended dosage and a doubled dosage were used for treatment to confirm the reproducibility of residual pesticide in the plant leaves by measuring the amount of residual pesticide. Thereby, the relationship between the residual pesticide and the toxicity on bee could be derived. Dinotefuran and imidacloprid granules were treated according to the recommended dosage of 0.06 g a.i./tree, and the double dosage of 0.12 g a.i./tree, while clothianidin granules was treated as the recommended 0.018 g a.i./tree and the double dosage of 0.036 g a.i./tree. The test method for foliage residual toxicity on bees is in accordance with the US EPA (1996b), “Honeybee Toxicity of Residues on Foliage” (OPPTS 850.3030) and the residual toxicity test of foliage on bees among the “Registration Criteria for Pesticides and Agents” as in [Annex 13] Criteria for Environmental Biotoxicity Test (Notification No. 2012-13 of Rural Development Administration). However, this method is with regard to liquid pesticides suited for air-spraying, and contains no specific information as to the treatment method, treatment period, or exposure method. Hence in this study, the leaves were collected and exposed to bees in the indoor part, as suggested in the guideline. The outdoor part, where the crops are planted and disinsected, adopted the conventional culturing method. Tomato, red pepper and cucumber were used as the test crops. The whole crops except roots were collected every 3-7 days after the test pesticide was applied along with the planting of crops. From the harvest, only the leaves (15 g) were prepared in test cages. Bees were anesthetized and inserted to 4 test cages filled with the leaves. Total 100 bees were separately inserted to the cages (25 bees per cage). After 24 hours exposure, the mortality rate and abnormality of bees were recorded. During the exposure, the temperature was 25 ± 2oC and humidity was 60 ± 10%. A feed tube was attached to each test cage to feed 50% sugar water. The test was terminated on the day when the bee mortality rate was 25% or lower. Maximum 35 days passed after the treatment of pesticides. During the testing, the entire crop body except for the roots was collected. The leaves were removed without damage and were homogeneously mixed. Among the mixture, 5 g was put into pretreatment and High Performance Liquid Chromatograph (HPLC). 5 g of the leaves was placed in a homogenizer cup, and 80 mL of acetone was added. The mixture was subjected to milling at 10,000 rpm for 5 minutes. The extract was suction-filtered, and the vessel containing the residue was washed with 50 mL of acetone and was combined with the filtrate obtained above. The combined filtrate was transferred to a 1000 mL separatory funnel, and added with 20 mL of saturated brine and 80 mL of distilled water in order. Then, 100 mL of dichloromethane was added and extracted twice as 50 mL portions. After layer separation, the mixture was dehydrated with anhydrous sodium sulfate and was concentrated under reduced pressure at 35oC. The concentrate was re-dissolved in 5 mL of ethyl acetate:n-hexane (50:50, v/v), developed in a silica SPE cartridge activated with 5 mL of n-hexane, and washed with Ethyl acetate:n-hexane (50:50, v/v). Then, it was eluted with 15 mL of ethyl acetate, concentrated under reduced pressure at 35oC, completely dried with nitrogen gas, and then analyzed in HPLC/UVD using 4 mL of acetonitrile. 5 g of the leaves was placed in a homogenizer cup, and 80 mL of methanol was added. The mixture was subjected to milling at 10,000 rpm for 3 minutes. The extract was suction-filtered, and the vessel containing the residue was washed with 50 mL of methanol and was combined with the filtrate obtained above. The combined filtrate was transferred to a 1000 mL separatory funnel, dispensed twice with 100mL and 50mL of n-hexane each, washed, dehydrated with anhydrous sodium sulfate, and concentrated under reduced pressure at 35oC. The concentrated residue was redissolved in 5 mL of dichloromethane. 1 mL (1 g sample) of residue was developed in a florisil SPE cartridge, which was activated in advance with 5 mL of dichloromethane, and was washed with 10 mL of dichloromethane. Then, it was eluted with 5 mL of dichloromethane:methanol (90:10, v/v), concentrated under reduced pressure at 35oC, completely dried with nitrogen gas, and analyzed in HPLC/UVD using 2 mL of acetonitrile. 5 g of the leaves was placed in a homogenizer cup, and 80 mL of acetone was added. The mixture was subjected to milling at 10,000 rpm for 5 minutes. The extract was suction-filtered, and the vessel containing the residue was washed with 50 mL of acetone and was combined with the filtrate obtained above. The combined filtrate was transferred to a 1000 mL separatory funnel, and added with 20 mL of saturated brine and 80 mL of distilled water in order. Then, 100 mL of dichloromethane was added and extracted twice as 50 mL portions. After layer separation, the mixture was dehydrated with anhydrous sodium sulfate and was concentrated under reduced pressure at 35oC. The concentrated residue was re-dissolved in 5 mL of n-hexane and developed in a florisil SPE cartridge, which was activated in advance with 5 mL of n-hexane, and was washed with 5 mL of n-hexane and 5 mL of acetone:n-hexane (90:10, v/v) respectively in order. Then, it was eluted with 5 mL of acetone:n-hexane (60:40, v/v), concentrated under reduced pressure at 35oC, completely dried with nitrogen gas, and analyzed in HPLC/UVD using 4 mL of acetonitrile. The growth of crops was investigated after the application of the insecticidal insecticides, dimidacloprid (2%), clothianidin (1.8%) and dinotefuran (2%) to the red pepper and cucumber. The residual pesticide in the leaves of the crops caused by the absorption of roots by time was analyzed, and the toxicity on bees was examined by the residual toxicity test of foliage. The seedlings of the test crops were prepared and planted along with the disinsection. The plant length excluding the roots, the weights of leaves and stems were measured to comprehend the growth of test crops, the red pepper and cucumber. The weights and lengths of the test crops were not significantly different among the control and treatment groups. However, the weights in general increased rapidly 14-21 days after planting. The lengths also increased 14 to 21 days after planting. While the growth in the length and weight of red pepper is low compared to that of cucumber, the increment is vivid 14 days after planting (Table 1). The increase in the length and weight of cucumber was 1.2 times in both average length and weight from the day 21 to day 28. The increment became rapid 28 after planting (Table 2). 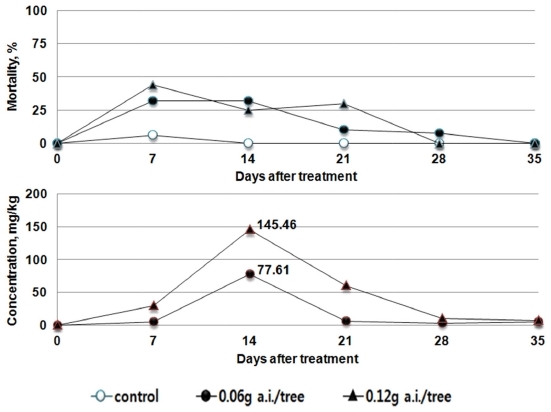 As a result of the Residual Toxicity Test of Foliage on Bees, the residual pesticide in the leaves of tomato after the treatment of Dinotefuran granule was the highest at the day 7 after treatment, as 125.04 mg/kg or above in the recommended dosage group (0.05 g a.i./tree). The figure decreased thereafter. The morality rate of bees was 70% or above at the day 7, and 100% at the day 14, decreasing thereafter. 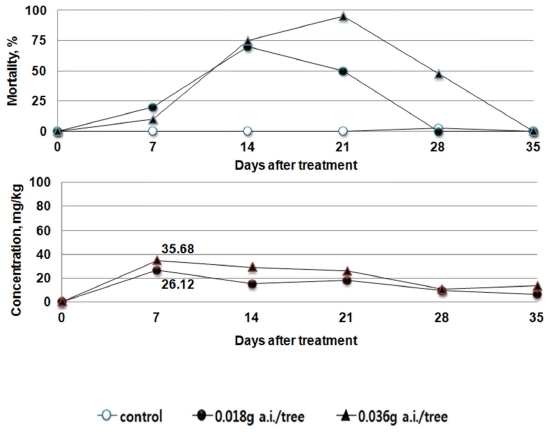 In the double dosage group (0.12 g a.i./tree), the maximum residue at the day 7 was 254.37 mg/kg, and the mortality rate was the highest (100%) at the day 14, which decreased thereafter (Fig. 1). Honeybee mortality and residues of dinotefuran in pepper leaves after pesticide application. 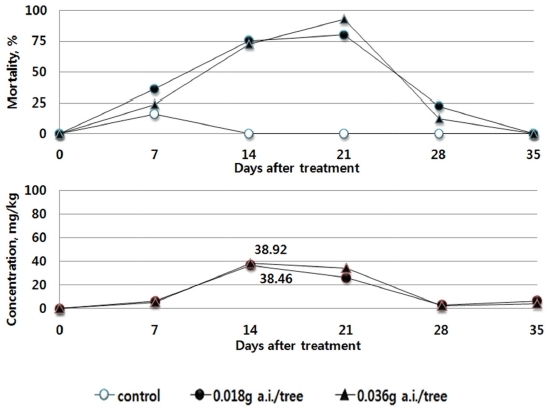 The maximum residual Imidacloprid in the leaves was 71.47 mg/kg in the recommended dosage group (0.06 g a.i./tree). In the double dosage group (0.12 g a.i./tree), the figure was 141.89 mg/kg. After the day 7, the residue decreased in general. 28 days after treatment, when the residual pesticide concentration ranged from 22.97 - 34.40 mg/kg, the mortality rate decreased to 25% or below. During the testing, the mortality rate of bees was 40% or below, indicating a low level of toxicity (Fig. 2). In the case of Clothianidin, the maximum residue was found at the day 7 from the treatment, as 26.12 to 35.68 mg/kg. Until reaching the day 21, this concentration was maintained, and the mortality rate was the highest at the day 21 as 50%, and as 95% in the case of the double dosage group. The residual pesticide in foliage as well as the mortality rate of bees at the day 21 also decreased (Fig. 3). Honeybee mortality and residues of imidacloprid in pepper leaves after pesticide application. Honeybee mortality and residues of clothianidin in pepper leaves after pesticide application. 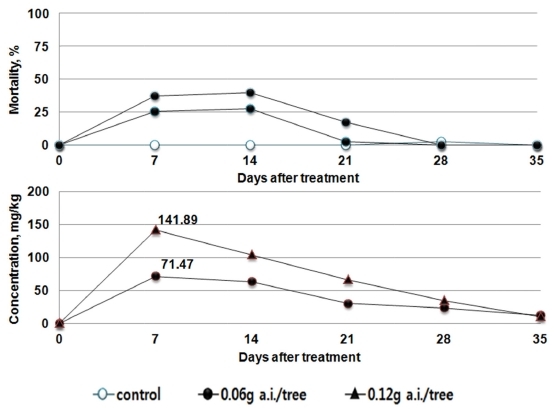 As a result of the Residual Toxicity Test in Foliage on Bees, the maximum mortality rate of bees was the highest at the day 14 after the soil treatment using Dinotefuran. Also, in the cucumber, the residual pesticide in the leaves was the highest as 124.71 mg/kg in the recommended dosage group (0.15 g a.i./tree) and 222.45 mg/kg at the double dosage group (0.15 g a.i./tree), both at the day 14. After 14 days from the treatment, the residual pesticide in the leaves and the mortality of bees gradually decreased. After 21 days, the mortality rate was 12% or below (Fig. 4). Honeybee mortality and residues of dinotefuran in cucumber leaves after pesticide application. 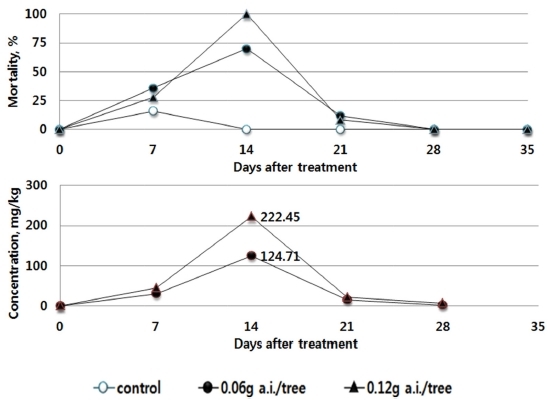 In the case of Imidacloprid, the maximum residual pesticide in foliage was the highest as 77.61 mg/kg in the recommended dosage group (0.06 g a.i./tree) and 145.46 mg/kg in the double dosage group (1.4 g a.i./tree), which decreased to 10.38 mg/kg or below after the day 28. The highest mortality rate (32-44%) was observed at the day 7, indicating that the influence is lower than those of dinotefuran and clothianidin granules (Fig. 5). Honeybee mortality and residues of imidacloprid in cucumber leaves after pesticide application. Honeybee mortality and residues of clothianidin in cucumber leaves after pesticide application. This indicates that the results derived from the toxicity on bees by absorption in tomato (Bae et al., 2013) and the results of residual pesticide in red pepper and cucumber with respect to the trend in the mortality rate of bees are similar. After the soil treatment using the pesticides, the residual pesticide in each crop leaf and the toxicity to bees were found to be the highest 7 to 14 days after treatment, and gradually decreased thereafter. The influence vividly decreased, after passing the day 21. The amount of residual pesticide in the leaves of the crops was the highest at the 7 to 14 days after the treatment of the pesticides. Although it decreased thereafter to become similar in trend with the mortality rate of bees, the residual pesticides in different types and dosages differed in their maximum amount. When directly compared, the maximum residual amount and the highest mortality rate did not always coincide. This indicates that the influence on bees can differ by the absorption, emission, growth of crops as well as the chemical characteristics of pesticides. Likewise, in the case of translocating pesticides, it was found that the influence came into effect as the chemicals were absorbed through the roots and emitted onto the leaf surface. According to the results of this study, it was found that, for greenhouse crops which are helped by bees for pollination, it is important to conduct risk assessment of the pesticides on bees being exposed and to decide the right time for releasing the bees, by applying the pesticides in accordance with the characteristics of target crops to comprehend the toxic influence on the bees. However, the bee toxicity studies conducted in Korea (including both the contact type and ingestion type) are focused only on the direct influence of pesticide which remained after the airspraying on pesticides and not the influence through translocating via penetration. In Europe and the US, proposed is a method for evaluating the toxicity of pesticide for soil treatment and translocating pesticide on bees, which adopts a different point of view. Such studies are on the developing stage of setting the directivity which involves not only the direct acute influence but also indirect longterm one (Defra, 2009; EFSA, 2009). Therefore, to secure the bee safety against the pesticides with various characteristics, the path of exposure of pesticides to bees should be investigated in various ways, and further studies are required to realistically comprehend the pesticide toxicity on bees, if any pesticide is apt to be exposed. Benjamin, A., (2008), Pesticides:Germany bans chemicals linked to honeybee devastation, by The Guardian, UK. Bruneau, E., J. Kievits, J. Lortsch, and S. Szke, (2009), Systemic plant protection substances and products: how to assess the risk for bees? A beekeeper’s point of view, II, Test and risk assessment (incl. systemic effects, field testing, bee brood), Hazards of pesticides to bees-10th International Symposium of the ICP-Bee Protection Group, p55-66. Defra, (2009), Systemic pesticide risk assessment for honeybees - research project final report, Science directorate, management support and finance team. EFSA, (2009), Test and risk assessment (incl. systemic effects, field testing, bee brood), Hazards of pesticides to bees-10th international symposium of the ICP-Bee protection group). Kim, J. H., C. H. Bae, Y. S. Kim, H. J. Park, C. K. Jung, Y. K. Park, and J. E. Kim, (2012), Honeybee toxicity and residues on foliage of crops after soil treatment of granular pesticides, Proceeding of the Korean Society of Pesticide Science, 11, page(s): 105. OECD, (1998a), OECD guidelines for the testing of chemicals No.213 Honey bee acute oral toxicity test, Paris, France. OECD, (1998b), OECD guidelines for the testing of chemicals No.214 Honey bee acute contact toxicity test, Paris, France. RDA, (2012), Rural development administration Standards of Pesticide Registration, Standards and Methods for Ecotoxicity Testing, "Honeybee toxicity of residues on foliage" (Rural Development Administration Notification No. 2012-13). Tasei, J. N., Delegue M. Ha P., and L. Belzunces, (2003), Registration of systemic insecticides and european and mediterranean plant protection organisation (EPPO) guidelines, Bulletin of Insetology, 56(1), p189-191. USEPA, (1996a), Ecological effect test guidelines OPPTS 850. 3020 Honey bee acute contact toxicity, Washington DC, USA. USEPA, (1996b), Ecological effect test guidelines OPPTS 850.3030 Honey bee toxicity of residue on foliage, Washington DC, USA.